Sustainable Vacations Grow in Popularity by Adding Solar Panels, Rainwater Harvesting, and More. If you like to live a green and environmentally friendly life, then eco camping is one of the best ways to go on holiday these days. And it has the added bonus of being a cheap way to take a holiday too. With all the advances in eco technology that have occurred in recent years, many new eco campsites have sprung up across the world. Things that you can expect to find at eco campsites include solar panels to heat the water. Shower and washing up buildings will have solar panels mounted to the roof to heat the water. Rainwater is often harvested and recycled throughout the sites. Signs will be evident asking people to use water sparingly. Toilets will often be composting ones. Around the site, low energy bulbs will be used and be set with timers to switch on and off with, so any waste of electricity is kept to a minimum. Some campsites will have their own wind turbines to generate green electricity. Take everything home. When you pack up to leave, take all of your rubbish with you, whether its biodegradable or not. Yes, biodegradable matter will rot down and disappear eventually, but its better to leave a place as you found it. Treat the land gently. 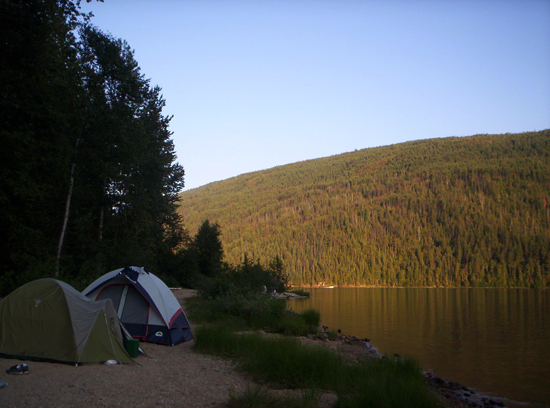 While camping, wear soft soles so that you can cause minimal disturbance to the land. Dont level the ground you are pitching your tent on; instead put cloths under sleeping mats to make a level sleeping area. Green washing up. You score top marks for bringing re-useable plates and cutlery rather than throwaway goods, but make sure your washing up liquid is earth friendly. And when youve washed up, dont empty the water into a stream or river — instead pour it onto plants or dry ground. Wrap it all up. Instead of throwing more wood on the camp fire to keep warm in the evenings, take garments like fleece jackets to give you extra warmth. Some mens waterproof jackets have detachable fleece linings in them, so you can wear one or the other or both together.